I read a lot of non-fiction. I’ve written about some of the books I’ve read on here (Good to Great, The Art of War, The Art of War (again), etc. ), but that’s just the tip of the iceberg. Most of the articles I share on Facebook (about 5 per day) comes from something I’d read in the past month. I believe it’s important to continually refresh ourselves (through learning). I do that by reading as much as I can — non-fiction. About 2 years ago, when I decided to go to business school, I read everything about business that I could get my hands on. I read the Heaths, Collins, Christensen, Pink, Godin, and many others. In amongst that reading, I continually came across a piece of wisdom — read fiction. At first, I was a little shocked by it. Read fiction!? And then, I started to understand a little bit more about what the reasons for reading fiction. Empathy is at the heart of the beginning of the solution to many of the world’s problems. When we empathize, we are able to recognize the emotions that another is feeling. At the root of compassion is empathy. [Note: sympathy is quite different from empathy. Sympathy is simply a concern for another’s well-being, where empathy usually refers to one sharing the same emotional state.] So, now that I’ve explained empathy, I need to tie it back into reading fiction. Don’t get me wrong, I’m still going to continue to read non-fiction — and lots of it. Though, I may start to whittle down the number of non-fiction books I read. I’ve just finished Dan Pink’s most recent To Sell Is Human, and I still want to get through Chrystia Freeland’s Plutocrats. Once I do that, I plan to make the switch and start reading more fiction. Will you join me? I’ve had very spotty internet connectivity over the past week or so and that’s why you haven’t seen any new posts from me for a while. I’ll continue to have spotty internet connectivity probably until next week, but there’s something I wanted to say before I got back into writing regularly here. After watching that trailer — it made sense. While I’m not necessarily an artist, I think the message that Godin is promoting is important: there is a bias for the middle road. And there’s certainly nothing wrong with that, but that bias to the middle road does come at a price. I’d say that this is something that I certainly have been mindful of with the things I’ve written about online. Some may point to my series on psi phenomena (telepathy, precognition, etc.) as evidence that I’ve long since blown past the middle road, but when I wrote those posts, I was careful to make sure that I cited a litany of scientific studies supporting the existence of such phenomena. Others may point to posts like the one I’ve written about hugs instead of handshakes, but that doesn’t seem like it’s too far from the middle road. 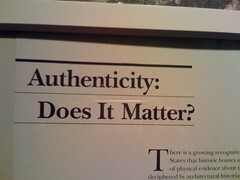 Regardless of who points to what, I wanted to say — today — I’m declaring that I’m going to err on the side of authenticity. What does that mean? Well, in the past, I may have shied away from sharing his opinion or that opinion — especially because it’s online! — ‘and things online are forever.’ I’ve come to realize that this is silly. Yes, I’ve read all the things out there about how the pictures you post online or the things you write about online could prevent you from getting job-x or job-y. I understand that, but I still think it’s important to strive to learn. How can I expect myself to grow/learn, if I don’t share some of my sensitive ideas and open them up for discussion and debate? How can I expect to have these ideas challenged and improved? I certainly can’t. I am the creator of this blog and my perspective of five years or five minutes ago do not necessarily reflect my views right now. My thoughts, opinions and viewpoints will change as I learn, grow, and develop my understanding of the world. Therefore, I reserve the right to allow my viewpoints to evolve and to change my thoughts, viewpoints and opinions over time without assigning any reason for such changes. I truly believe this and hope that those who may look to things I’ve written in the past and try to hold it against me will realize that I fully expect that my ideas will grow, shift, and change. This seems important to make note of because who knows, I may yet one day run for public office and I could totally imagine a clever reporter digging up things I’ve written in the past with glee showing that I was, in fact, on the “other” side of an issue that I may be staunchly for (in that present day). Who knows what the future holds. I know one thing’s for sure, the kind of change that I want to be part of on a global scale certainly won’t be made by me (or others) erring on the side of the middle road. So long as I’m true to myself — authentic — and keep to my ethics/morals, I feel confident in standing up for whatever I’ve said. So — this is not to say that I’m going to start advocating some extreme positions in tomorrow’s post (or even the next day’s), but I will, as the title suggests, err on the side of authenticity. I hope you’ll join me in this learning experience — maybe we’ll be able to teach each other something.